The 1880s saw a decline in England’s economic world supremacy. At the same time the population had increased fourfold between 1800 and 1900. 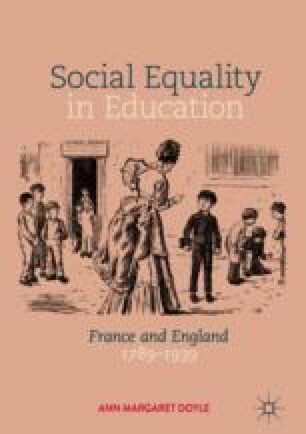 A national system of education was finally set up in 1902 which saw the Local Education Authorities assume responsibility for primary and secondary education. A dual system of voluntary and state-maintained schools was upheld. Following World War I, the Labour Party, instead of campaigning for common schooling at secondary level, pursued a policy of increasing scholarships so that more working class pupils could attend the selective grammar schools. At the end of the chapter the historical data is analysed in terms of the three explanatory factors: persistence of ideology, social class alliance, and, the nature of the state.